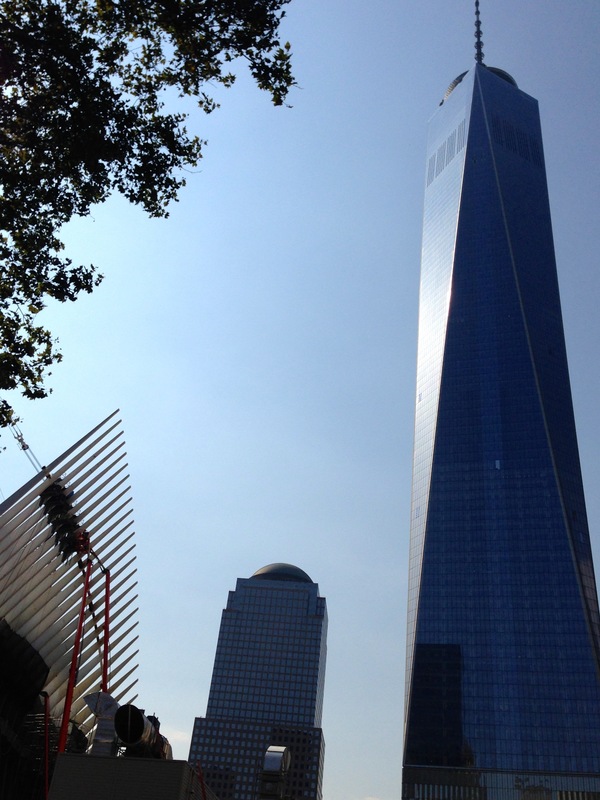 On Tuesday, I visited the 9/11 Memorial in New York City. After posting my plans on Facebook, my friend John contacted me to let me know that he was a docent-in-training at the museum. His docent classes would run until 5 PM, so we made plans to meet up afterwards. He described this as an opportunity to practice his skills, but it was really a personalized, guided tour. I had been thinking of combining the visit to the memorial with a trip to 20th Century Cycles. It seemed like a great combination, since Tuesday night is also Oyster Bay Cruise Night, but on further review, I realized the schedules would not work. Visiting 20th Century Cycles would have to go back on the to-do list. I took PATH from Harrison station, as suggested on the memorial site. For people traveling from the greater Philadelphia area, on a weekday, this is the best choice as it makes travel to the site quick & easy. There is construction going on all around the memorial, but the park itself is complete and beautiful. I arrived early enough that I had an hour to walk around the area, see the survivor tree, and read the names around the reflecting pools. I took a bit of time at the southern pool to read the names of the first responders, which are grouped in one area. Tuesday, after 5 PM, entry to the museum is free; I had no objection to the entry fee, but since it lined up with other plans, I took advantage of the free tickets. They start handing out the tickets at 4:30 PM, but I recommend getting in line around 4 PM. 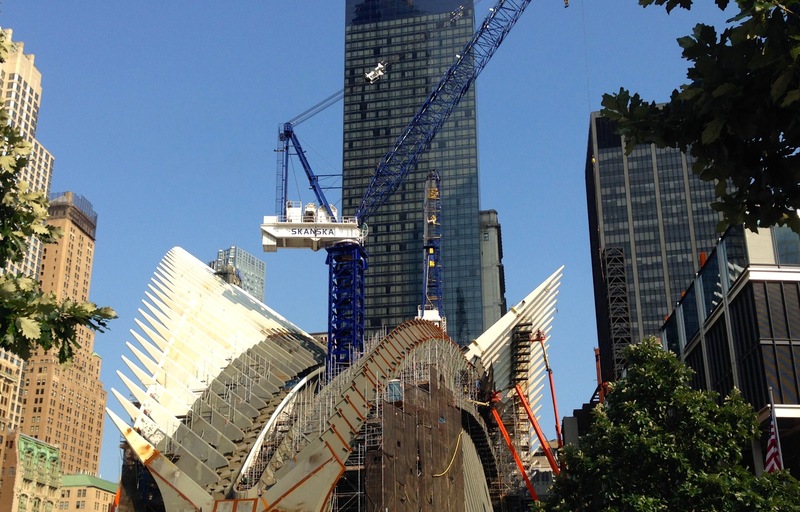 After I had my ticket, I waited near the north pool and watched the work construction on the transportation hub. Any time the cranes fired up, most people in the area turned to watch. I look forward to returning once the hub is complete. Once inside, John & I walked along the museum path, which travels from just below ground level, down to bedrock. 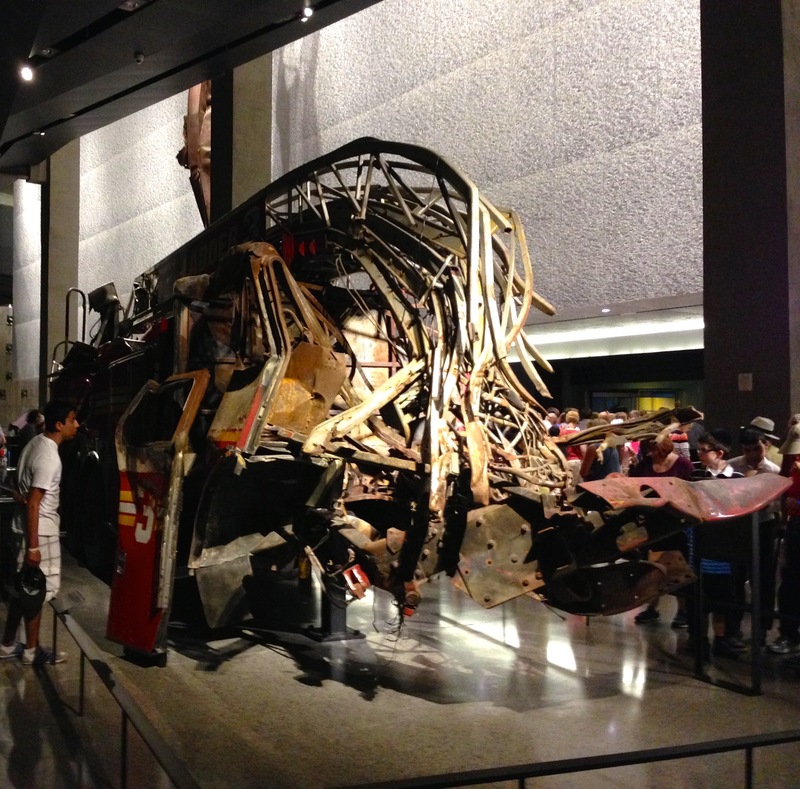 Along the way are many artifacts from the twin towers, which were made more special by having someone to provide details and put them into context. Once down at the lowest level, you can see the remains of original box columns, grounded in the bedrock. Above, as part of the roof, are walls of brushed metal that represent the original footprints of twin towers. While viewing the artifacts, and thinking back to that horrible day, I was repeatedly reminded that the area where I was standing was never intended to be occupied: when the towers stood on this spot, this area would not just be underground, but in the ground, with the box columns that are now visible, surrounded by earth. It seems everyone who remembers that day, has a moment or image that connects them to the experience. For me, it was the plight of the first responders who rushed into the towers to save others. As I approached remains of Ladder 3, I was overwhelmed by waves of emotion which I can not capture in mere words. The Historical Exhibition sits in the footprint of one of the towers; it is a walking path that traverses the timeline of 9/11 (and some events leading up to it). Along the path there are artifacts, replays of the television coverage, detailed history and alcoves with audio presentations. The audio presentations are made up of recording from that day along with recollections of survivors. As the audio plays, a visual display shows where and when they occurred. All these items can be overwhelming, so the exhibit is set up with early exits and passages which allow you to go around some areas that are just too much. At the start of the exhibit, the crowd was much like any museum crowd, with overlapping conversations at normal volume, but as people traveled down the path, conversations became fewer and took place in hushed tones. The experience takes you back to that tragic day; even those who are too young to remember, seemed overwhelmed and struck dumb. The timeline ends with a future and rebuilding area, which is brightly lit and upbeat, but for me, it could not overcome the waves of emotion. The moment I found most difficult, was the representation of the afternoon of 9/11; in this area are details of the first responders while a steady stream of emergency locator chirps play in the background. The memorial, museum and, especially the Historical Exhibition, have been created beautifully and with great care – I can not image a better memorial to that tragic day. If you plan to visit the memorial, I would like to recommend that you prepare yourself, but I don’t believe that is possible.